I feel like the entire internet is dieting – especially the food blog world. And I feel like I’m totally playing into it by posting a gluten free/grain free/paleo recipe today – right after another lightened up recipe. Am I dieting? Not really. But these muffins are in keeping with some resolutions. Resolution #1 – Use up what’s already in the pantry/fridge. Resolution # 2 – Make more of an effort to link up with the #ImprovCookingChallenge monthly. I love this group because it regularly stretches me outside my comfort zone, but it’s something I dropped the ball on again and again in 2017. Here’s to a new year and more consistency! 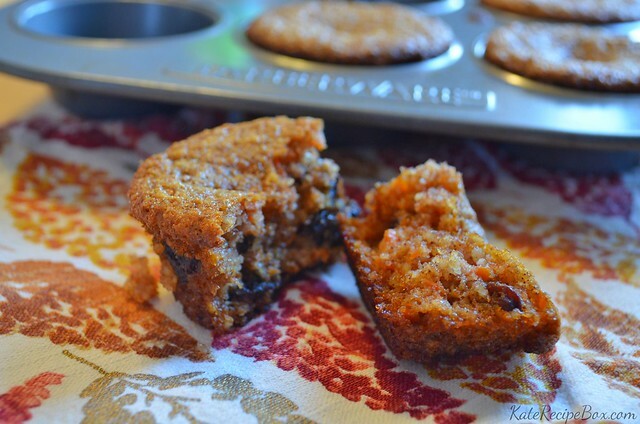 The theme for January is Ginger and Spice – and I was immediately drawn to these muffins because I already had all the ingredients on hand (yay, resolution #1!) 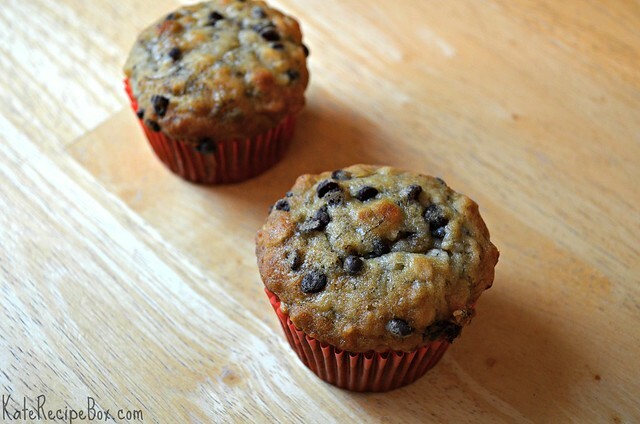 These make a nice grab-and-go breakfast or snack and my kids gobbled them up. Preheat your oven to 350 and line a muffin tin with paper liners. In a bowl, whisk together the flour, salt, baking soda, cinnamon, ginger, and clove. In another bowl, beat together the eggs, maple syrup, and coconut oil. Stir in the ginger, coconut, carrot, and raisins. Add the wet ingredients to the dry and stir until combined. Divide between wells of the muffin tin. Bake for 20-25 minutes. I have been in total use-it-up or throw-it-out mode. I think it’s part of nesting. I’ve cleaned out both freezers, the refrigerator, the pantry and our overflow canned good stock in the basement the last few days. I’m not sure the kitchen has ever looked better! We had a few bananas that were just past prime. 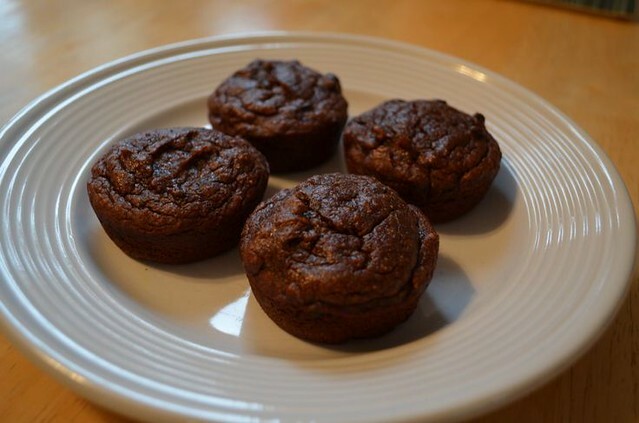 I probably could have given them a day or two and someone would have eaten them or tossed them in a smoothie – but my must-clean-off-the-counters brain couldn’t handle that, so I decided to try a new muffin recipe. 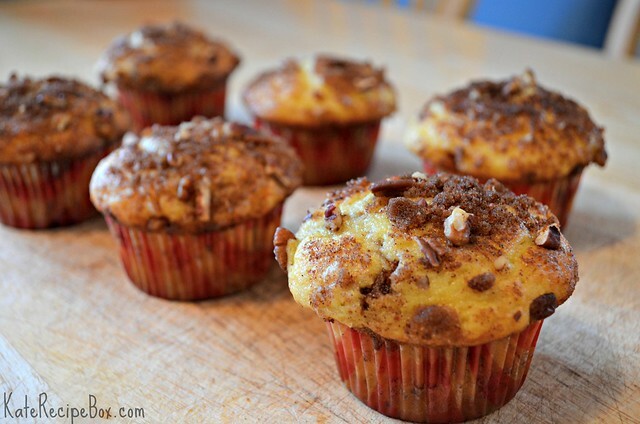 I’ve yet to meet a banana muffin I didn’t enjoy, but these were really good. Using mini chocolate chips keeps the banana flavor from being overwhelmed and the oatmeal added a nice chewiness. Preheat the oven to 375 degrees. Line a muffin pan with cupcake liners and set aside. In a large mixing bowl, beat together the egg, oil and sugar until smooth. Stir in the bananas until evenly combined. In another bowl, whisk together the flour, oats, baking soda, baking powder and salt. Stir into the wet ingredients until just moistened. Fold in chocolate chips. Fill the cupcake liners 3/4 full. Bake for 18-20 minutes, until a toothpick comes out clean. Let cool for five minutes before removing from the pan. I never make it through Lent without doing one pizza Friday so it seems fitting to finish out this year’s Lenten meal series with a pizza. I originally started this series to get away from just ordering a pizza every Friday – it was a bad habit and something we’d do so often it didn’t feel like anything special. Things have really swung the other way – breaking out this Friday pizza was such a treat. 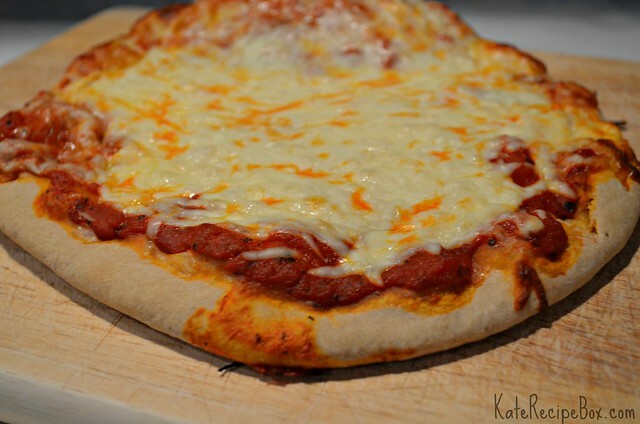 My go-to pizza recipe is on the plain side. It works perfect on the grill or paired with lots of toppings (which we usually load on) but falls a little short for a plain, oven-baked pie. I ran across this recipe when we still had a bottle of Guinness left from St. Patrick’s Day so it was meant to be. The beer adds just the right amount of flavor to this dough to make it perfect for a more plain pie. In a small saucepan, heat the Guinness to 115F degrees. (I used a candy thermometer to keep track.) Stir in the yeast and sugar until dissolved and let stand for five minutes. In the bowl of a stand mixer, combine the flour and salt. On low, mix in the Guinness, followed by the olive oil. Add additional olive oil or flour as needed to get a dough ball to form. Transfer the dough to a greased bowl, cover and let rise until doubled, about an hour. To bake: spread into a 12″ circle, top as desired and bake for 20-25 minutes in a 425F degree oven. I’m a one-note baker when it comes to quick breads. And that one note is banana bread. I honestly can’t remember the last quick bread I made that wasn’t banana. When Heather picked breads as the theme for this month’s What’s Baking? challenge, I knew it was the perfect excuse to finally try something else. This bread was awesome – a nice crunch to the crust while being soft and fluffy inside. It’s not too sweet so it could pass for a breakfast bread but it’s just sweet enough to be dessert, too. Also, it makes for some pretty amazing French toast. 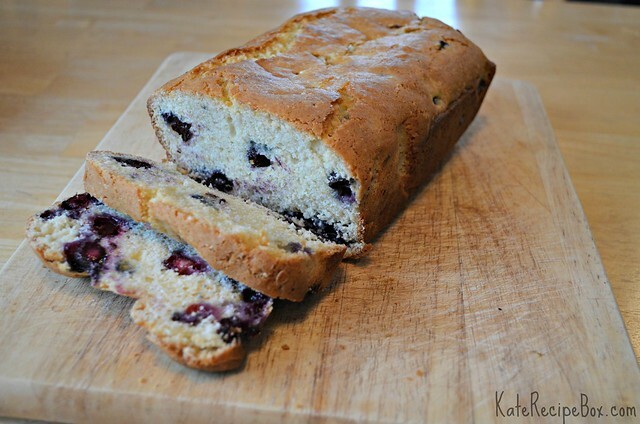 I’m sure this will be making several repeat appearances during blueberry season! You can check out the roundup of the breads made by other bloggers at Heather’s blog, Hezzi-D’s Books and Cooks, later this month! Preheat the oven to 350F degrees. Line a 9×5″ loaf pan with parchment and grease the parchment. In a large bowl, whisk together the flour, baking powder, baking soda and salt. Mix in blueberries. In a medium bowl, whisk together the buttermilk, vanilla, oil, egg and sugar until thoroughly combined. Add wet ingredients to dry ingredients and mix until just combined – it’s fine if it’s slightly lumpy. Pour batter into prepared, lined pan and bake for 40-50 minutes, until golden on the outside and a toothpick inserted comes out clean. I love lists. I make a lot of them. Probably too many. One of my current favorite lists is for the Day Zero Project – a challenge to tackle 101 goals in 1001 days. I’m currently on my second list – and I’ve only got about five months left. Hello, crunch time! One of the things on my list was to make cinnamon rolls and I finally tried them out for Christmas this year. Since two dozen were a lot for us, we delivered some to our parents and neighbors too. I’m pretty sure making them for everyone is going to be an annual tradition from now on! So, so happy to have these under my belt. In a saucepan, combine the milk, vegetable oil and sugar. Scald and then let cool for 45 minutes. Sprinkle yeast over the warm milk mixture and let stand for 5 minutes. Stir in 4 cups of the flour and transfer to a large bowl. Cover and let rise in a warm place for an hour, until doubled in size. Stir in the additional 1/2 cup of flour, baking powder, baking soda and salt. Sprinkle your work area generously with flour and roll the dough into a large rectangle. 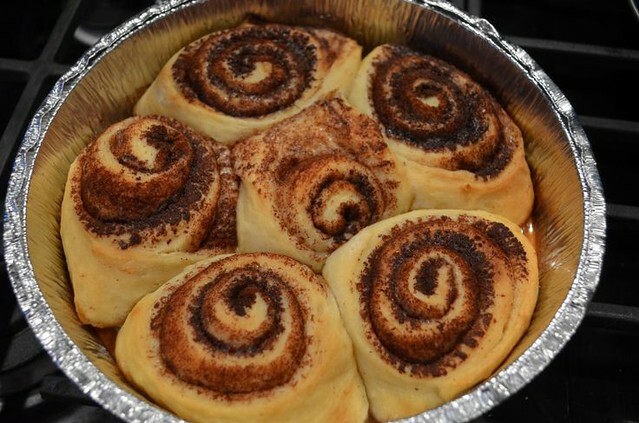 Spread melted butter over the dough, sprinkle with sugar and cinnamon. Roll up from the long side and pinch the seams together to seal up the rolls. Cut the log into 1 1/2″ rolls. Place 1 Tbsp. melted butter in the bottom of each pan you’re using (a little more for larger pans) and arrange the rolls. You’ll get about 4 8″ round pans with 6 rolls each. To bake now: Let rest for 20-30 minutes and then bake at 375F degrees for 13-17 minutes, until golden. To freeze for later: Cover pans with foil and freeze. Thaw in the refrigerator overnight and then follow the “bake now” directions. 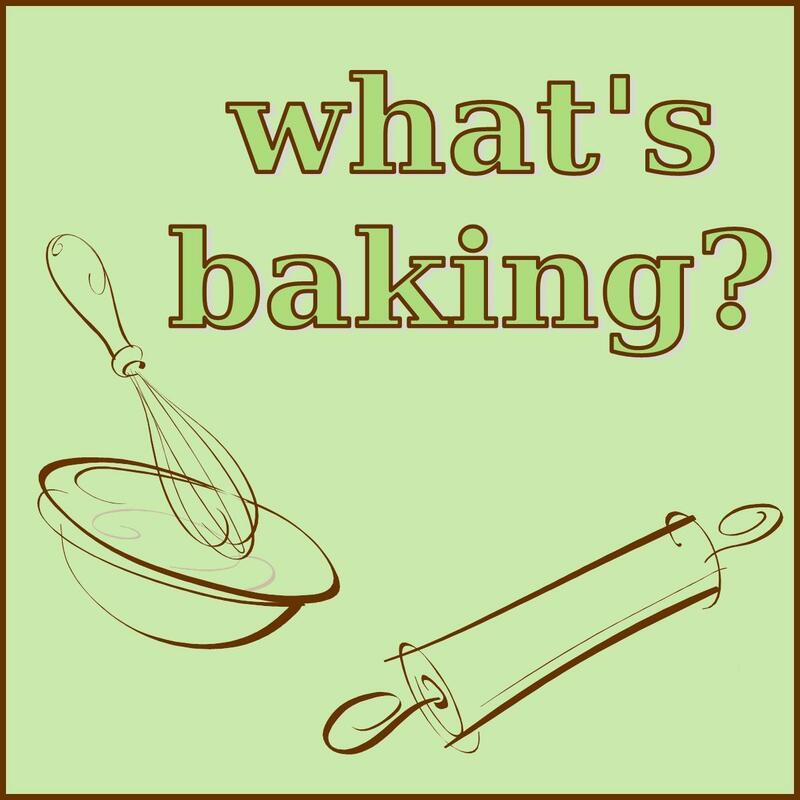 The theme for this round of What’s Baking is pumpkin – perfect for the season! Since I knew I’d be posting my pumpkin recipe this month, I wanted to pick one that would fit in with October Unprocessed. I actually made them last month and these aren’t totally unprocessed – I used a chocolate peanut butter and chocolate chips – but subbing an appropriate nut butter and leaving out the chocolate chips would easily bring them into line. I’m going to be making them again soon. Like, probably today. You can check out the roundup of other pumpkin goodies later this month on Carrie’s Sweet Life. Preheat the oven to 375F degrees and spray a muffin pan with cooking spray. Add all of the ingredients except for the chocolate chips to a blender and blend on high until the oats are gone and batter is smooth and creamy. Stir in chocolate chips then pour the batter into prepared muffin pans. Bake until the tops of your muffins are set and a toothpick inserted into the middle comes out clean,about 10-12 minutes. 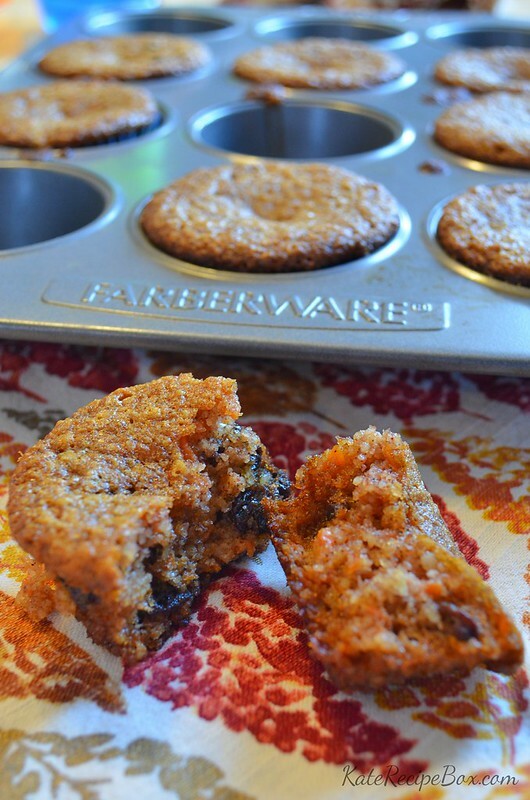 Allow muffins to cool in pan for 10 minutes before removing to a cooling rack to cool completely. I haven’t tackled that many kitchen projects since Jake was born, but when we ended up with a pile of over-ripe bananas, I decided it was time to get back to it. I’ve waned to try this recipe for a while – but never seemed to end up with enough bananas for it. Even though this is a quick bread, it’s not super quick – but the extra steps give this bread a really flavor. 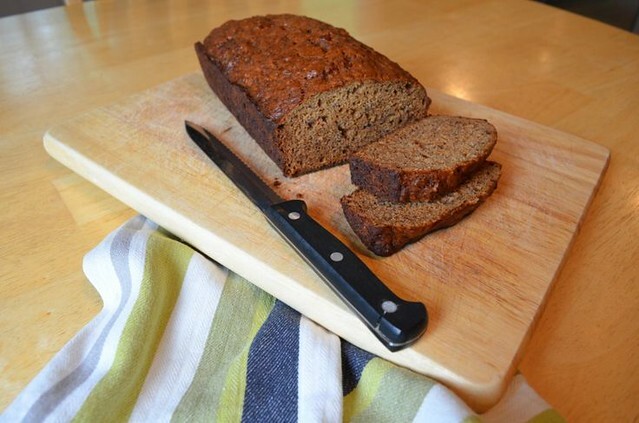 I don’t know that this will be my go-to recipe just because of the number of bananas and steps (I’d probably want a truly quick bread recipe for most days), but it’s perfect for when I’ll want something a little special. Preheat oven to 350F degrees and spray a loaf pan with non-stick spray. Place bananas in a microwave safe bowl, cover, and microwave until bananas are soft and have released their liquid, about 5 minutes. Transfer bananas to a mesh strainer over a bowl and let drain for 15 minutes, stirring occasionally. Add liquid to a saucepan and reduce to 1/4 cup. Stir reduced liquid into bananas until smooth. Whisk in butter, eggs, brown sugar and vanilla. Add banana mixture into flour mixture until just combined, with some streaks of flour remaining. Pour batter into the loaf pan. Bake for 45-65 minutes, or until a toothpick inserted in the center comes out clean. Let cool for 10 minutes, remove from pan and cool completely on a wire rack. We had our families over for St. Patrick’s Day a few weeks ago. No, we’re not Irish – we just love a reason to get together. 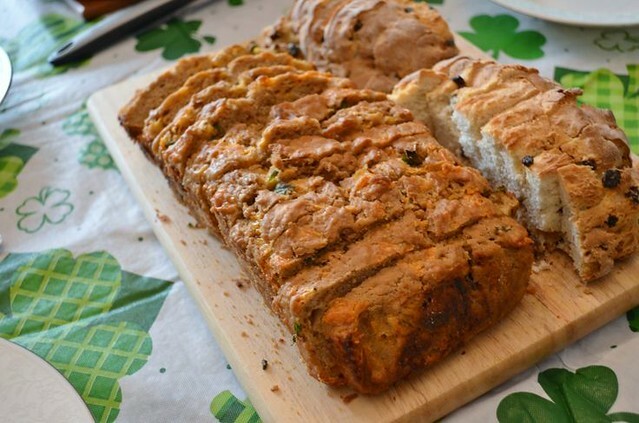 We made two menus: the traditional corned beef, cabbage and Irish soda bread was one and a big pot of beef and Guinness stew along with this bread for the people who weren’t into the traditional dishes. This bread was a big hit and a great mix of sweet and savory. I’m sure it’ll make repeat appearances in our house whenever I have an extra bottle of Guinness hanging around. After lunch, we played a game of luck (Left-Center-Right), complete with lottery scratch-offs for prizes. I think the luckiest part of the day was getting to spend it with people we love. Preheat oven to 375F degrees. Spray a loaf pan with non-stick spray and then line with parchment paper. In a medium bowl, whisk together the flour, sugar, baking powder, and salt. Pour in the beer and stir until the dry ingredients are evenly moistened. Fold in the cheese and the chives. Pour the batter into the prepared pan evenly. Pour the melted butter evenly over top of the dough. Bake for 45-50 minutes or until a tester inserted near the center comes out clean. Cool for 5 minutes before removing from pan.